Why would I have anything to say about manufactured homes? Well I live in one first of all. Secondly, I’m not the kind of person who just sits in a house and says “oh well, I wish it had such and such but it doesn’t so I guess I’ll just live without it.” My house doesn’t have networking, so I want to put it in. My house doesn’t have a wood burning stove, so I put it in. My house doesn’t have light switches that work properly, so I’m going to work on fixing them. In my time of doing work on my house, most recently the past couple weeks while trying to retrofit a room, I have decided that I absolutely despise manufactured homes. One of my rooms, which I have nicknamed the “dragon room” due to all the dragon figurines and other dragon-themed stuff in it, is undergoing a complete retrofit. I’m pulling out all the drywall, carpet, ripping the popcorn off the ceiling, putting in network boxes as well as some other things. I’ve discovered a number of troubling things. They don’t have real drywall. What they have is drywall whose paper surface is wallpaper. This means you can’t just cut into it, do some work, and patch the hole back up. How the heck are you supposed to plaster over flowery wall paper and expect it to match even a little bit? The drywall isn’t screwed in. I didn’t really expect it to be screwed in properly, but I also didn’t expect what I found. First off, it is stapled in with a staple gun. I don’t mean they just used staples every foot or so instead of screws, I mean they put staples about every 2-3 inches. And not just one staple. Usually about 3-4 staples in every location. Secondly, as if all those staples were not enough to hold it in place, all the drywall is glued to the 2x3s as well. And not just a little bit of glue, in some places I will have to scrape it off the studs so that it will be flat for the new drywall. Yes, I said 2x3s. The walls are made out of 2x3s instead of 2x4s. So the walls are only 3 inches deep instead of 4. Not only does this mean I would have to custom cut some wood (I’m sure Lowe’s carries tons of 2x3s for all the idiots who don’t know how to built proper walls) if I ever needed to replace something, it also means all my wall-boxes have to be shallower, which means they are also harder to find. Some of the perimeter walls also have 1/8″ plywood underneath the drywall. Again, they glued and then stapled the 1/8″ plywood every few inches. And because it is so thin it just shreds when you try to peel it off the studs. And by the way, this means there is twice as many staples to pull out later because they stapled the 1/8″ plywood and then stapled the drywall over the top of it. Let’s also talk about insulation. While not quite as bad as I first feared when I saw how it was setup, it’s still pretty bad. The insulation on the perimeter walls isn’t blow in, but it isn’t attached to the paper. You see the paper is just 4×8 foot sheets of paper glued to the studs (are we seeing a theme here? Now I know why insurance companies are always so freaked about your manufactured home burning down, it has a few gallons of flammable glue everywhere). The insulation is basically “paperless” and just pushes up against the paper they glued in. No attic. I don’t mean an attic that is really hard to crawl through, I mean none what-so-ever. This means your only other choice of running cable is to go below the house. Which is about 14″ of usable crawl space through dirt filled with garbage they left behind when putting the house on it’s foundation (including razor blades) and a few thousand spider webs. Oh, and all the piping and ducting that you have to crawl over, under and around. Let’s also talk about the fact that there is about 18″ of “sub floor” to get through, including insulation, to get to the actual floor, at which point you just have to kind of guess where the wall is you want to put a hole in. Because lets face it, with flower pattern covered walls it’s not like I can cut a hole big enough to put a drill in and drill down. Not to mention some of the heating ducts run inside this “sub floor” area. I accidentally shoved a coat hanger right through the middle of the heating duct (since it is a “soft” duct instead of metal) while trying to find the electrical I had to pull down. Electrical that doesn’t make sense. 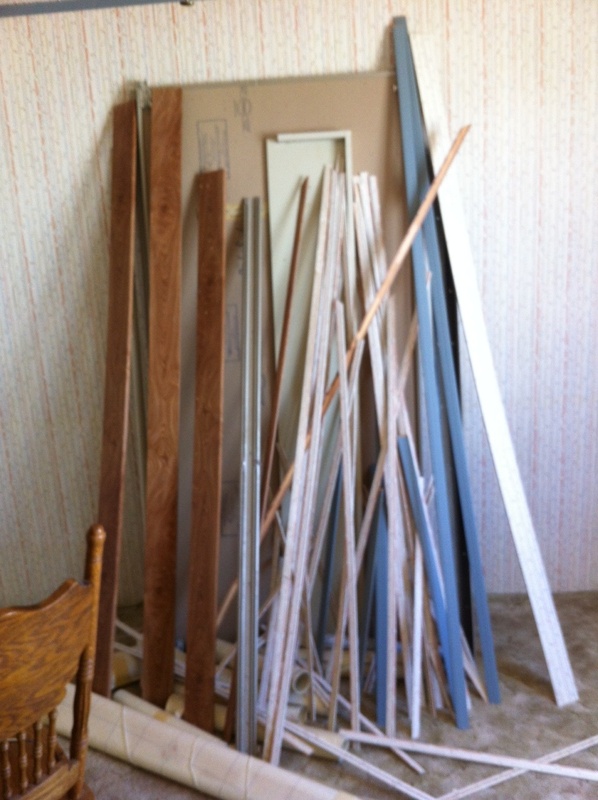 I decided to rip out the closet from the dragon room since it was just wasting 2 feet of space in a 10×12′ room. Well, after I ripped into the temporary wall I discovered that the electrical in that wall goes down through the middle of the floor instead going over 1 foot to the permanent wall and then down through the floor. For that matter, why does all the electrical from every box go down through the floor? Why not just chain through the walls like a normal house so it’s easy to see what is linked to what? That would be too easy, so lets make it difficult and have all the electrical linked in the boxes and then go down below the floor so I just have to kind of guess which way the power is traveling. Since we are talking about electrical, you know those stupid light switches that turn on and off electrical outlets? The ones they used to use in the 1950s before they invented ceiling fans? Yeah they still use those. So I will be cutting out a piece of the ceiling to run electrical the proper way to the ceiling fan so the light switch actually works the way anybody would expect. And this is where I found the blow in insulation, as it fell all over me after pulling out the piece of drywall. Cathedral ceilings. Yea, maybe they look great. But guess what, when you have to drywall those it’s a pain. The walls in this room vary in height from 7.5′ to 8.5′. Which means no matter what I will be custom cutting every piece of drywall I put in. And because it goes over the normal 8′ height I will have to plaster a horizontal line on 3 of the 4 walls as well. Wood floors. No I don’t mean hard wood, or even laminate floors. I mean the actual floor that the floor is installed on is wood. And not a hard wood, it’s like some kind of particle board that doesn’t hold staples well. Yes staples is what they used to hold the base floor down. Which means now that it is 20 years later I have to go back and re-screw down the floor because it squeaks like mad since none of the staples are holding tight and all the wood panels are at varying heights now. Wood trim over joints instead of actually finishing up the drywall. I can’t describe how much trim I pulled out of that one room, but you can see the picture below (sorry it’s so blurry). That is all out of this 10×12′ room.